Joint replacement surgery is a remarkable medical advancement that dramatically improves the quality of life. In 2006, nearly 800,000 joint replacements were performed in the United States, involving hips and knees primarily. The shoulder, elbow, wrist, ankle, metacarpophalangeal and interphalangeal joints are also being replaced. It is estimated that by 2030, 4 million hips and knees will be replaced annually in the United States. Infection is the most serious complication of joint replacement. Infection occurs in approximately 0.8 to 1.9 percent of knee replacements and 0.3 to 1.7 percent of hip replacements. Approximately 1 to 2 percent of prosthetic hip or knee replacements develop infection over the lifetime of the prosthetic joint. Thus, prosthetic joint infection (PJI) is not uncommon and is likely to be encountered by primary care and internal medicine physicians. A high index of suspicion is essential. The diagnosis and treatment of PJI is complicated and requires a care team, including an orthopedic surgeon. Establishing an etiology for PJI is of paramount importance in providing effective therapy. Therapy commonly includes prolonged courses of antimicrobials and surgical intervention. Effective therapy is most likely achieved when recommended treatment algorithms are followed. Given the frequency, morbidity, possible mortality, and complexity of optimal treatment, physicians must be familiar with the diagnosis and treatment of PJI. Are you sure your patient has prosthetic joint infection? What should you expect to find? PJI presents at various time intervals after joint implantations. To a significant degree, the time of onset determines the presentation and to a lesser degree the infection organisms. Acute postoperative wound infection occurring within days or 3 months after joint implantation. If there is a sinus tract to the device, the diagnosis is established. Often the challenge in the early days after surgery is to discriminate between superficial wound infection (or sterile hematoma) versus that which tracts to the prosthesis. These patients have fever, wound inflammation, local pain, and leukocytosis. Delayed onset of PJI is seen 2 to 24 months after prosthesis implantation. This presentation is indolent and manifest as joint pain, particularly with weight bearing or joint movement. Fever and local signs of wound inflammation are often minimal or absent. These patients may have had early wound infection that was treated as superficial; however, most will have had an uneventful recovery but will report increasing joint pain over time. Late acute onset infection of a previously well functioning joint prosthesis. These patients often have or recently had an infection at a site distant from the prosthesis and are presenting with hematogenous seeding of the prosthesis. The clinical picture is that of acute septic arthritis with fever, joint inflammation, and pain on active and passive motion. There is a particularly high rate of joint seeding with S. aureus bacteremia. How did the patient develop prosthetic joint infection? What was the primary source from which the infection spread? As implied by the classification of PJI’s as acute postoperative, delayed onset, and acute late onset, these infections are a result of intraoperative wound or device contamination or in the case of acute late onset PJI result from hematogenous seeding of a prosthetic joint by bacteria invading from a remote site of infection. Intraoperative contamination seems obvious with PJI arising as part of an overt early postoperative wound infection. The delayed onset indolent infections arise as a result of intraoperative device contamination with less virulent bacteria such as coagulase negative staphylococci, viridans streptococci, corynebacteria (diphtheroids). This hypothesis is supported by the notably decreased rate of this category of PJI as intraoperative techniques enhanced the sterility of the operative field and perioperative antibiotic prophylaxis protected against intraoperative contamination of the surgical field. Lastly, there are occasional PJI’s that are recrudescence of prior but quiescent infection in the replaced joint. The classic example of this is recrudescent mycobacterial infection after replacement of a joint previously destroyed by tuberculosis. Which individuals are of greater risk of developing prosthetic joint infection? The risk factors for PJI can be subdivided into patient related factors, surgical procedural factors, and postoperative factors (early and late). Patient related risk factors include revision of a prior arthroplasty or previous PJI at the site, tobacco abuse, obesity, rheumatoid arthritis, neoplasm, immunosuppressed state, diabetes mellitus, and active infection at a remote site at the time of joint implantation. Surgical procedure related risks include prolonged procedures (>2.5 hours), doing bilateral joint replacements at a single operation, allogeneic blood transfusion. Early postoperative risk relates largely to impaired wound healing or co-morbid conditions which prolong hospitalization and increase the rate of nosocomial infections. Late postoperative risk hinge on invasive infections with associated bacteremia. In particular, in one study S. aureus bacteremia was associated with a 34 percent risk of seeding stable, well functioning prosthetic joints. Although awareness of risk factors may raise one’s suspicion for PJI in a given patient, the diagnosis should be suspected and sought in all patients presenting with painful dysfunctional prosthetic joints. A high index of suspicion is appropriate in the wake of any bacteremic illness, especially S. aureus bacteremia. At various stages in the history of a prosthetic joint a variety of clinical entities could mimic PJI. During the early postoperative period, the challenge is to distinguish superficial wound infection or hematoma from acute infection involving the prosthetic device. These patients, whether infected or not, present without clinical signs and symptoms suggesting infection. Joint pain is the major symptom. Ultimately, infection must be excluded. If there is no underlying inflammatory disease or remote infection, the ESR and CRP may help to prioritize concerns regarding infection. The ESR may remain elevated longer. Elevation in the CRP above 13.5mg/L (knees) and 5mg/L (hips) have modest sensitivity to detect infection but specificity is less than optimal. Elevation of both the CRP and ESR without an alternative explanation should prompt further evaluation for infection whereas if these are both normal, the likelihood of infection is low. The tests that establish the diagnosis will vary depending upon the clinical scenario you are assessing. Regardless, the overarching principle is to “establish a microbiologic diagnosis before you confound the evaluation by giving antibiotics empirically”. You need to identify the infecting organism in order to design therapy. In a patient with a draining sinus that tracks to the prosthesis, the joint should be aspirated. Sinus tract culture are unreliable for identification of the pathogen causing osteomyelitis or PJI. Send for analysis (total white and red blood cell count, differential leukocyte count, crystal analysis). Ideally two separate aspirates should be obtained. In a patient with an acutely inflamed joint, again two separately aspirated synovial fluid specimens should be cultured and analyzed. When confronting a persistently painful and dysfunctional prosthetic joint, indolent infection should be suspected and testing to clarify the diagnosis initiated. Procalcitonin and serum interleukin-6 (IL-6) are being studied. Increased serum IL-6 looks promising as an indicator of infection. Synovial fluid from the knee with greater than 1700 WBC or with more than 65 percent neutrophils or hip fluid with 4200 or more than 80 percent neutrophils have sensitivity greater than 85-90 percent to detect PJI. Synovial fluid culture if not confounded by recent antibiotic therapy has a sensitivity ranging from 56 to 75 percent but is highly specific (95 to 100 percent). Fluid should be inoculated into blood culture bottles as well as on solid media for optimal yield. When PJI is suspected but not confirmed, the efforts to establish a cause and treat joint dysfunction often include surgery. If infection has not been confirmed but the suspicion is high, the surgical procedure should be prosthesis explantation with delay of reimplantation of a new device until infection has been ruled out or treated. For optimal culture results, high risk patients should not have been taking antibiotics for at least 2 weeks prior to surgery and perioperative prophylaxis should be delayed until after specimen collection is complete. Because the concentration of bacteria in these infections is low, Gram stain of intraoperatively obtained synovial fluid or tissue is insensitive and cannot exclude infection. Intraoperative histopathology. If a skilled pathologist is available to look at frozen periprosthetic tissue specimens, this may help guide intraoperative decisions. Finding 5 or more polymorphonuclear leukocytes/hpf is highly suggestive of infection (sensitivity > 80%, specificity > 90%). At least 3, and preferably 5 or 6, periprosthetic tissue samples should be sent for aerobic and anaerobic culture. Culture should be incubated for 14 days to facilitate isolation of fastidious slow growing organisms, e.g… Proprionibacterium spp., Corynebactertium spp. Sonication of the explanted device and culture of the sonicate bath fluid (aerobic and anaerobic). This test must be planned in advance with the microbiology laboratory. Sonication dislodges bacteria in biofilm adherent to the device. This process may increase culture sensitivity by 15-20 percent without loss of specificity. 5 or more polymorphonuclear leukocytes/hpf in periprosthetic tissue. Increased synovial fluid WBC and percent polymorphonuclear leukocytes (knee > 1700 WBC or 65% polys; hips > 4200 WBC, or > 80% polys). Recovery of a virulent organism (an unlikely skin contaminant) in a single culture of synovial fluid or an intraoperative specimen. Recovery of the same organisms from 2 or more aspiration or intraoperative specimens (obtain 3 to 5 specimens from periprosthetic tissues). That the isolates are identical can be confirmed by common microbiology tests. Confirmation of identity is important when cultures yield organism that are frequent culture contaminants, e.g. coagulase negative staphylococci. Recovery of 20 or more colony forming units per mL from the sonicate (sonication of the device in 400ml of Ringer’s solution). What imaging studies will be helpful in making or excluding the diagnosis of prosthetic joint infection? Plain radiographs of the prosthetic joint should be obtained. These lack sensitivity and specificity and rarely provide evidence of infection. They may reveal loosening of the prosthesis which is a factor in decisions regarding treatment strategy. Radionuclide scans, computed tomography, magnetic resonance scans and FDG-PET scans should not be obtained routinely. They are rarely useful. Technetium-99m diphosphonate scan remain positive after surgery for more than a year and do not distinguish infection from post surgical change or loosening. Technetium-99m labeled sulfur colloid bone marrow scintigraphy combined with labeled leukocyte scanning is more accurate than other scans, but rarely used. If you decide the patient has prosthetic joint infection, what therapies should you initiate immediately? Thereafter, the care team should develop a definitive plan. Whether this is the initial infection involving the prosthetic joint or relapse of a previously treated infection. The strategies for treating are listed below. The optimal feasible strategy for a given patient will depend on the factors noted above. The strategies attempt to eradicate infection and to the degree possible maintain a functioning joint. Two-stage revision: explant the infected device, treat infection, reimplant a new prosthesis. Often a spacer (articulating or static) impregnated with antibiotics that targets the implicated pathogen is placed during surgery to provide local therapy in addition to systemic antibiotic treatment. Single-stage revision: treat with antibiotics, explant the prosthesis, and insert a new prosthesis at a single surgery and complete antibiotic therapy thereafter. The final decision regarding the surgical strategy for a given patient should be made by the orthopedic surgeon in consultation with the care team. For patients with PJI occurring shortly after prosthesis implantation (< 30 days) or presenting as acute hematogenous septic arthritis (symptoms for < 3 weeks) who have a well-seated (not loosened) prosthesis, no sinus tract, and an antibiotic susceptible organism (acceptable IV and oral agents for a long course of therapy) the debridement-retention strategy can be considered (Figure 1). Success rates of 50-60 percent are typical for this approach versus 90 percent for two-stage exchange strategy. Given the potentially better outcome with the two-stage exchange, this later strategy may be more desirable than debridement-retention for young, healthy patients with low operative risks. The debride-retain strategy is sometimes used for patients who do not meet the criteria for this approach, i.e., for those patients who refuse surgery or in whom surgery is contraindicated. Failure rates are high under these circumstances. The organism may be more antibiotic resistant and difficult to eradicate (Figure 2). This is the most commonly utilized strategy in the United States. Cure rates are about 90 percent. Patients who fail this approach once may be treated again with reduced but acceptable success rates. Successive failures are associated with increasing likelihood of failure. 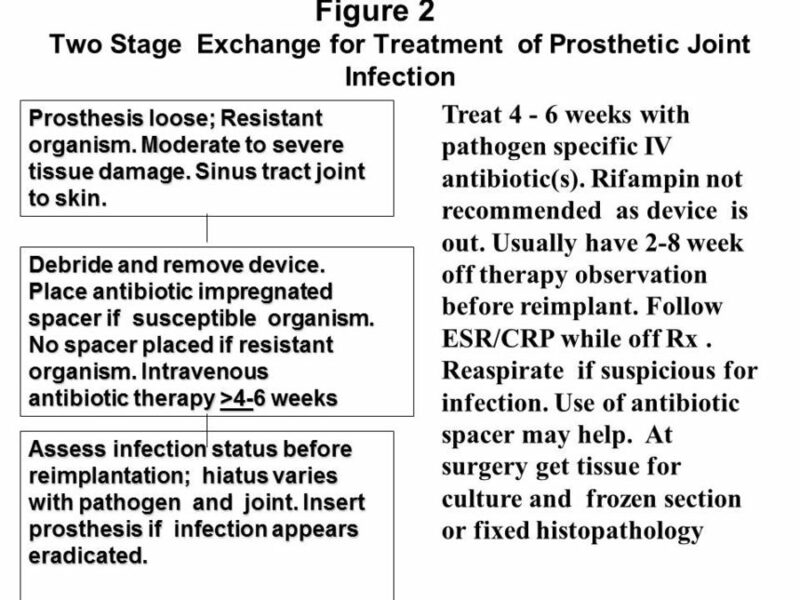 A one-stage or direct exchange strategy, while used more commonly in Europe than the United States, is reserved for hip PJI where the pathogen is known preoperatively and is relatively susceptible (Figure 3). There must be good periprosthetic soft tissue and adequate bone stock. Antibiotic impregnated cement is often used. These patients often begin antibiotic therapy before surgery so that infection is suppressed at the time of the direct exchange. Patients have failed multiple treatments for PJI. Patients have been infected by resistant organisms or cannot tolerate the prolonged antibiotic therapy that would be required for effective treatment. Patients have poor bone stock or a poor soft tissue envelope. Patients have co-morbidities that preclude other surgical strategies. Possible joint athrodesis (fusion) with treatment of osteomyelitis is attempted. Amputation is the final option to cure recurrent or otherwise untreatable PJI. This is also a consideration in non-ambulatory patients. Antibiotic therapy is not only based upon the causative organism and its susceptibility but regimens also are structured around the surgical strategies described previously. Implanted foreign material is uniquely vulnerable to infection. Small inocula of bacteria cause infection and infection by relatively avirulent organisms is common. Polymicrobial infection is noted in 6%. Antibiotic therapy varies depending upon the proposed surgical strategy and the implicated pathogen (Table I). For staphylococcal PJI to be managed by debridement and retention, give 2-6 weeks of pathogen-specific intravenous antibiotic therapy plus rifampin (if the organism is susceptible) 300 to 450mg PO bid. Delay starting the rifampin until 3-5 days of effective therapy have been administered. The initial antistaphylococcal therapy reduces the local innoculum of bacteria and thus reduces the risk that rifampin resistance might emerge during therapy. staphylococcus is susceptible) bioavailable oral agent for 3 months in patient with PJI involving hip, elbow, shoulder, or ankle prostheses and for 6 months for prosthetic knee infections. Other considerations include but are not limited to β-lactams, trimethoprim/sulfamethoxazole, minocycline or doxycycline (Table II). For debridement and to retain strategy when PJI is caused by other organisms, give 4 to 6 weeks of targeted intravenous antibiotic therapy followed by prolonged oral therapy as noted above. Although there is not a consensus, indefinite oral antimicrobial suppression is often used when the debridement and retention strategy is employed (rifampin alone or in combination is not used for indefinite suppression). Indefinite suppressive therapy is strongly preferred for treatment of patients who are elderly or otherwise poor candidates for retreatment should PJI relapse. Clinical evaluation for end-organ toxicity unique to the agent(s) administered. For those patients in whom the infected device has been explanted and the bone site debrided, a 6-week course of targeted intravenous antibiotic therapy is advised (Table I). Rifampin is not used in the treatment of staphylococcal infection with this strategy since its specific target is the organism embedded in biofilms adherent to the device which has been removed. Orthopedic surgeons often place antibiotic impregnated spacers in the explant site. Patients should be monitored carefully for treatment toxicities using blood tests and clinical evaluations. ESR and CRP are followed serially with gradual return to normal (CRP more rapidly than the ESR) considered indirect evidence of effective therapy. At the time of reimplantation periarticular tissue should be obtained routinely for culture and pathology. Evidence of persistent infection warrants further antibiotic therapy and long-term suppression similar to that used with the one-stage direct implant strategy. The factors that impact the decision to give suppressive therapy are the same as those considered in patients treated by debridement-retention. Antibiotic treatment of patients treated in this manner follows the plan outlined for the two-stage exchange strategy even though reimplantation is not planned. If there is no residual infected bone or systemic infection pathogen specific antibiotics can be discontinued 48 hours after the amputation. If there is residual infected bone, 4 to 6 weeks of pathogen specific intravenous antibiotic therapy is given. If there is systemic infection, pathogen specific therapy should at least encompass that recommended for the systemic infection. Physicians in the United States commonly give long-term (possibly indefinite) suppressive antibiotic therapy for PJI patients treated with the debride and retain strategy or single-stage prosthesis exchange. The practice is not as widely accepted in Europe. Data suggest that PJI treated with these two strategies eradicates infection in a significant percentage of patients, perhaps 50 to 60 percent of those treated. However, in another 25 to 30 percent of those patients, infection has been suppressed but not eradicated. Continued indefinite suppressive antibiotics maintains the prosthesis in a functional seemingly uninfected state, be that actually cured or suppressed, thus resulting in overall prosthesis salvage rates of 75 to 85 percent. Patients with inflammatory cells in the periprosthetic tissue taken at the time of new prosthesis insertion (one-stage or two-stage exchange) should receive long-term suppressive antibiotics postoperatively. Oral antibiotics used for suppression should be active against the targeted pathogen, cause little toxicity, and be well tolerated. Rifampin (even in combination with another agent) is rarely used for suppression. Some agents that can be considered for suppression are listed in Table II. Pathogen specific therapy is ideal; however, occasionally PJI is “culture negative”. These patients are treated with broad spectrum antimicrobial regimens which should encompass staphylococci, other Gram-positive bacteria and Gram-negative bacilli, for example vancomycin plus ciprofloxacin. When culture negative PJI is the result of prior antibiotics, the previously taken antimicrobial agents provide a clue to what is likely to be effective definitive therapy. For optimal therapy having a microbiologic cause with known antimicrobial susceptibility is ideal. One can use polymerase chain reaction methods to recover bacterial genetic material which can be sequenced to identify the infecting agent. To use this approach the tissue for study must be handled with sterile technique. Additionally, sonicating the entire device to increase the culture yield can be considered as well. Culture negative PJI is probably best treated with a two-stage prosthesis exchange strategy. As noted in the strategies used to treat PJI, in almost all patients there is an orthopedic surgical component to therapy. Surgery provides two components of therapy. It debulks the infection itself and removes both the foreign body and devitalized tissue which might impair the efficacy of antibiotic therapy. It also addresses the non-functionality of the device, such as loosening, which is a source of pain. If an antibiotic impregnated spacer is placed, surgery may also facilitate drug delivery to the site of infection. It is the rare patient where joint aspiration establishes a diagnosis and antibiotic therapy is initiated without surgical intervention. These are usually patients with severe comorbidities that preclude surgery or elderly patients who refuse surgery. What complications could arise as a consequence of prosthetic joint infection? Antibiotic-induced adverse events and end-organ toxicity. Deep vein thrombophlebitis, with or without pulmonary emboli, can complicate lower extremity PJI or its therapy. Failure to effectively treat PJI can lead to loss of joint function, including arthrodesis (fusion) or amputation. The outcome of treatment of PJI is difficult to generalize. Prosthesis salvage and restoration of function is markedly impacted by the involved pathogen, the clinical presentation of infection, the tissue health around the infected prosthesis, and the patient’s general health which may limit therapeutic options. Whether the current PJI is the first at the site versus relapse from prior treatment is an important factor in outcome. The skill and experience of the care team is another important variable in outcome. Adherence to the algorithm for surgical and medical care impacts outcome too. Eradication of infection and providing a highly functional joint is achieved in 90 percent of patients treated using a two-stage prosthesis exchange strategy. One-stage direct prosthesis exchange treatment cures infection and provides a highly functional joint in 80 to 83 percent of patients. The debride-retain strategy for staphylococcal PJI when care is compliant with the algorithm achieves joint salvage at 2 years in 55 to 75 percent of cases. Overall successful outcome at 2 years – joint salvage and good function – ranges from 57 to 77 percent of PJI cases. Procalcitonin and interleukin-6 (IL-6) are under study for the identification of patients who might likely have PJI and thus merit further evaluation. Routine use of PCR and molecular probes for pathogen identification in investigation of periprosthetic tissue is under study. How can prosthetic joint infection be prevented? Infusion of prophylactic antibiotics should be completed before tourniquets are inflated to prevent bleeding during surgery. Orthopedic surgeons advise patients with joint prostheses to take prophylactic antibiotics prior to dental work and to have intercurrent bacterial infections treated promptly. The benefit of antibiotic prophylaxis prior to dental work has been questioned; nevertheless, the practice continues. Betsch, BY, Eggli, S, Siebenrock, KA, Tauber, MG, Muhlemann, K. “Treatment of joint prosthesis Infection in accordance with current recommendations Improves outcome”. Clin Infect Dis. vol. 46. 2008. pp. 1221-1226.